Architects from the Gulf States Region of the American Institute of Architects gathered in Chicago to celebrate the 2014 Honor Awards program. The renowned members of the Kansas City jury noted the diversity and outstanding design of the projects they viewed from architects practicing in the Gulf States. “Respect for history in the renovation/restoration projects,” “attention to detail,” and “simple yet elegant detailing” were some of the common themes running through the jury comments when discussing the merits of these designs. This Honors program identifies built works of distinction, and ten projects were recognized as exemplary design solutions. An accomplished group of design professionals from the Kansas City area juried the projects. David Powell, AIA, of Hastings Architecture Associates in Nashville, TN acted as Program Chair. Jury Members: Chair, Steve McDowell, FAIA, founding Principal and Director of Design at BNIM; Jamie Kolker, AIA, Assistant Vice Chancellor of Campus Planning and Director of Capital Projects in Facilities Planning & Management at Washington University; and Laura Pastine, AIA, Project Architect at BNIM. Together, they awarded ten projects from the 109 submittals from architects in Alabama, Arkansas, Louisiana, Mississippi, and Tennessee. The addition and renovation to the Fay Jones School of Architecture in Vol Walker Hall at the University of Arkansas is a complex but resolute hybrid of a beautifully restored historical building (65,000 SF), and a modern addition and insertion (37,000 SF). This restoration instills new life in Vol Walker Hall, the campus’s original library and home to the School of Architecture since 1968. 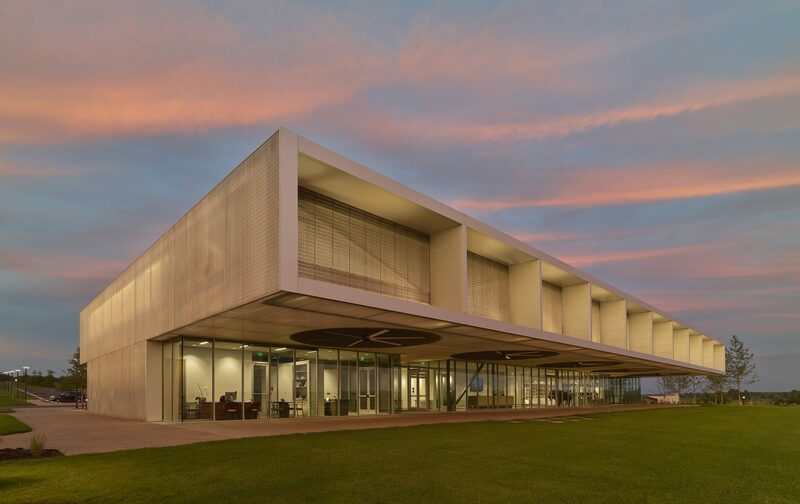 The architects’ challenge was to create a progressive multi-use space for a State Governor’s Residence. The high-performance addition should be site-friendly and accessible, and sympathetic to the existing Georgian Home with minimal impact. The project honors the State Residence by framing and supporting it, rather than upstaging it. It is currently awaiting LEED Gold Certification. This urban church houses a unique congregation in Cleveland, Ohio. The architect undertook a renovation to an existing warehouse for an urban church which includes multifunction sanctuary space, small conference rooms, offices and support spaces. The new facility had to be extremely low cost to build, operate, and maintain. The result is a unique, distinguishable, and inviting image. Previously located in a moldy and dilapidated space, the new home of the Northwest Arkansas Free Health Center (FHC) is bright and airy, and is located on the University of Arkansas Medical School campus. The architect designed a new home to bring dignity to the underserved. At $71/sf, it’s nice to know they could afford such nice furniture! Until recently, an 800-seat theatre venue in downtown New Orleans had been a shadow of its colorful days of stage performances, music and vaudeville. This restoration and renovation brought it to life again. The Montessori Elementary School sits in the small triangular remainder of a site prone to flooding and houses classrooms, a conference room, and a new commercial kitchen. This certified LEED Silver project illustrates that a shared commitment to economy and environmental responsiveness is not exclusive, but can inform and act as an inspiration for the design. This new laboratory and classroom building on the Technical Center campus of Hinds Community College in Jackson, MS includes six classrooms, laboratories, offices and study areas. The new building, sited to shape a future campus green, fits in this understated and pragmatic context, but it also elevates the prospect of the campus. Eco Modern Flats is a sustainable modern design renovation of an existing 96-unit apartment complex. This project is the first LEED for Homes Multifamily Platinum project in the state of Arkansas. It re-imagines space in a palette of steel and cedar to breathe new life into an otherwise banal, layered construction system. This would be a really cool place to live; I want to live there! It’s like a little modern day Melrose Place! The repurposing of a small abandoned mid-century modern bank into the Fort Smith Regional Art Museum (RAM) lifts expectations for a neglected neighborhood, serves as an exemplary tale of urban reuse and renewal, and acts as a beacon for the arts. The challenge of new architecture is creating that first personal statement that reflects a client’s mission through design – buildings should mirror their use. Old Briar is a private residence in rural west Tennessee; the childhood home of the clients who are returning home after 25 years in Chicago. Located on an 80-acre working farm, the home they envisioned needed to communicate respect for the landscape as a resource supporting the region, the ethics of sustainable agrarian practices, and humility, deeply rooted in their upbringing. The Honor Awards were presented at the AIA Gulf States Region reception in Chicago, Illinois in conjunction with AIA’s National Convention.